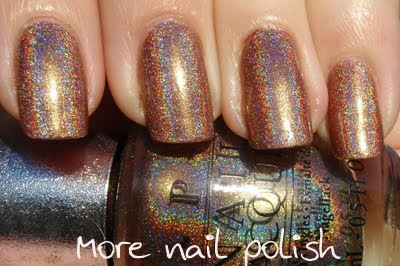 OPI Designer Series Desire is a rich golden brown holographic polish. This was three coats. Application, as always with OPI, was perfect, smooth and buttery. Here is a closeup of the holo. The actual colour on the nail is probably a little darker than my photos show (but not as dark as Scrangie's swatch) It's a lovely polish and very complementary on my nails. 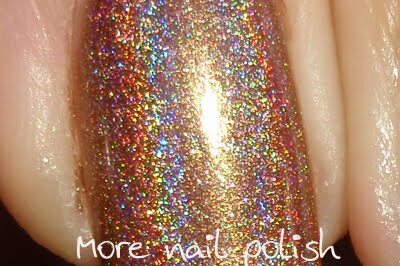 I believe this polish may be discontinued now, but I still managed to pick mine up on ebay for a decent price in the last few months. This was the first DS polish I got and I absolutely love it! If I see another bottle around I will grab it as a spare! !